So what did I think about Paso Robles? Fifth, this region is very conducive to growing excellent grapes. Soil diversity is the norm, with over 45 soil series in this region, including plenty of calcareous soils. There are numerous microclimates, adding even more diversity to the region. In general, there are large temperature swings, from very warm days to much cooler nights. A swing of 40-50 degress from day to night is not unusual. This is very beneficial to their grapes. There is also a longer growing season which means that their grapes have a longer hang time, longer than many than other regions. A longer hangtime can lead to grapes of greater depth and complexity. Sixth, one of my most significant impressions is that Paso Robles is still a new wine region, one still seeking an identity, still conducting much experimentation. As such, it is a dynamic area, still developing and transforming itself. Don't get me wrong, as I don't consider this a flaw. To me, it is very exciting, as it is a region of possibilities. The Paso Robles AVA (American Viticultural Area) is less than thirty years old, having been established in 1983. Since then, the AVA has been expanded twice, in 1997 and 2009, and there currently are efforts to divide the region into 11 sub-appellations. If that passes, the wines will still be required to have "Paso Robles" on the label, with the sub-appellation below it. This is intended to protect and support the Paso Robles AVA. Though the Paso Robles area consists of approximately 614,000 acres, only about 26,000 are planted with vineyards. In 1990, there were less than 20 wineries in Paso though there are now over 200 wineries, and it has become California’s fastest growing wine region. About two-thirds of these wineries though produce less than 5,000 cases. So most of the wineries are still very small operations. Though over 40 wine grape varieties are grown in this region, Cabernet Sauvignon (38%) and Merlot (15%) make up over 50% of total plantings. Interestingly, Paso Robles also sells more than a majority, 58%, of their grapes to wineries outside their AVA. Much of these grapes go into value wines that are labeled as California or Central Coast. I think all of these figures will change in the future as Paso Robles seeks to improve, to produce more wines for their own AVA. Their vineyards could probably be put to much better use than selling so many of their grapes to other wineries. It seems that Paso Robles is still trying to determine its signature grape, which best represents their region. I am not sure that is even necessary, though plenty of other regions also seem to want to claim a signature grape. Why not have several grapes which best exemplify a region? That is probably more accurate for many regions. Pigeonholing a single grape may be too limiting, and other grapes that grow very well in the region may get marginalized. Seventh, from all of the Paso wines I tasted, I generally preferred their Rhône-style wines, made from a variety of Rhône grapes, including Syrah, Grenache, Carignane, Marsanne, Roussanne, Grenache Blanc and more. Some of these wines were quite compelling, able to compete with wines from anywhere else in the world. They could be wines of character and complexity, as well as simply delicious. I enjoyed others of their wines too, from Merlot to Zinfandel. I visited one winery, Bodegas Paso Robles, which produces wines from Spanish and Portuguese grapes and their wines were impressive. I think the region has much potential for those types of grapes and it would be nice to see more wineries working with them. There are a few wineries currently doing so, though it is still very uncommon. Paso Robles wines range from inexpensive value wines to high-end ones, and I found excellent examples of both, as well as good ones priced in-between. Eighth, obviously, like any region, not all of their wines were good and some were over-priced. But the good far outweighed the bad. My most common complaint is that I found some of the wines were too high in alcohol and seemed unbalanced. This could partially be due to the longer hangtime which can cause grapes to become over-ripe. This is something wineries should pay attention to, especially when there seems to be a growing movement toward wines with less alcohol. Ninth, it really surprised me when multiple Paso wine makers told me that Rhône-style wines, even Syrah, are a tough sell. Though I know wines such as Cabernet Sauvigon, Merlot, Chardonnay and such are more popular than Rhône-style wines, I did think that at least Syrah was also a good seller. Locally, it seems that the popularity of Rhône-style wines is growing. How popular are they in your local area? I hope the popularity Rhône-style wines grows and there is much reason why it should. Such wines can be delicious, pair well with food and give you something different to taste. It helps that the Rhône Rangers exist, an organization devoted to promoting Rhône-style wines, and that many Paso wineries participate in that group. Tenth, I enjoyed some very delicious food while in Paso Robles and the surrounding areas. They have several restaurants that primarily use local and sustainable ingredients, which is certainly easier with all of the fine local ingredients that are available. Even their highest-end restaurants are fairly casual places, where diners may be garbed in a suit, or shorts and a jersey. One of the surprises of the trip was when I stumbled upon a top-notch donut shop! There is room for growth, for more restaurants and diverse cuisines. Currently, there are some limitiations on the types of restaurants available but I expect that will change in the near future. This presents opportunities for entreprenurial restaurateurs to enhance the culinary scene of Paso. In the coming weeks, I will go into more detail about my experiences in Paso Robles, including reviews of my favorite wines, restaurants and activities. Make Mother’s Day special this year by treating the important women in your life to fabulous desserts while also helping fight breast cancer. During the week leading up to Mother’s Day, May 3–9, more than 150 restaurants, bakeries, cafés and chocolate shops throughout Massachusetts will participate in Boston Bakes for Breast Cancer by preparing unique desserts. Desserts will cost around $8 and 100% of sales will benefit breast cancer research and care at Dana-Farber Cancer Institute. The 11th annual Boston Bakes for Breast Cancer is dedicated to Pat Nasson. Pat was a 23 year breast cancer survivor and the late mother of Leslie Hewson, pastry chef and owner of The Mediterranean Restaurant in Oak Bluffs, Mass. Boston Bakes for Breast Cancer began in 2000 by Carol Brownman Sneider to pay tribute to her mother, Eva Brownman, who lost her battle with breast cancer in 1973 at age 44. Since its inception the event has raised more than $370,000. Check out this list of participating restaurants. What do you know about Paso Robles? You can read all you want about a wine region, but actually being there is far more educational. Immersed in its atmosphere, you can visit the vineyards and wineries, chat with wine makers and winery owners, dine at the restaurants, and ask all of the questions you desire. You can learn about what has not been written about the region, or what might even have been incorrectly written down. Last week, I had the chance to spend a few days in Paso Robles, a whirlwind tour exploring the food, wine and travel options in this California wine region. I obviously could not visit the entire region in that short time period, but I did form some impressions based on what I saw, heard and experienced. My experiences were largely positive and I had a very enjoyable time in Paso Robles. I was fortunate to share my experiences with a number of other fine writers and bloggers, some I have spoken to before online but whom I had never met in person before. The list included David of McDuff's Food & Wine Trail, Kori of Wine Peeps, Kathleen of Bistro Broad, Scott of Southern Living, Richard of People's Palate, and Peter & Ann of On The Menu. It was so nice to get to know them better, and to hear differing opinions about our shared experiences. That helped to provide some more perspective for my impressions. First, what initially struck me about this region was its natural beauty, its lush greenness and perfect weather. When I had left Boston, it had been pouring rain, but hours later I found sunny skies in San Luis Obispo. The greenness was due in large part to recent rains in the region which fed the vegetation. The hills and mountains, the large vineyards, the Pacific coast, and much more all contributed to the alluring beauty of the land. Second, it has a very laid-back, homey and casual ambiance. There is little pretension in this region. The people are friendly and warm, and downtown Paso Robles is a quaint place, with lots of small shops, restaurants and tasting rooms. It seems less commercial and busy than Napa/Sonoma. In fact, numerous locals are proud to consider themselves the "anti-Napa." They don't want to become a clone of Napa, and at least at this point, they definitely are not. Third, the region has undergone lots of rapid, but organized growth. This has included the rebuilding after the significant earthquake damage in December 2003. Several higher-end and compelling restaurants have opened in the last few years, including Artisan and Thomas Hill Organics. The Hotel Cheval, a small boutique hotel, opened about three years ago and it seems to be one of the best places to stay while in Paso. Yet there is plenty of potential for additional growth and expansion. Fourth, the region was once well known, even by the Salinas Native Americans, for its hot springs. The earliest white settlers of the region also capitalized on these springs, but at some point they seemed to fall out of favor. Paso Robles currently does little to promote their hot springs and I feel this is an opportunity they could avail themselves of to help promote their city. It is an asset they could use to attract even more visitors. After my recent journey to Paso Robles, I will be writing numerous posts about my experiences as I found much of interest there. I do recommend that you visit this wine region, and will provide more specific recommendations in the near future. This post will be the central location for links to all of my Paso Robles posts, making it easy to locate all of them in one place. The posts will be listed in chronological order, from oldest to newest. And more to come, including about: Abalone Farm, J. Dusi, Steinbeck and much more. In our fast paced world, it seems that too many families fail to get together except on major holidays, and even that sometimes does not occur. Major holidays are a good time to get together but they also contain their own disadvantages. There are so many expectations on such holidays, that a person can pass through the holiday almost like a robot, just going through the motions. The problem is that many families are losing touch with each other, traditions dying off, because they do not get together frequently enough. Family recipes may not be passed down to the newer generations and could vanish forever. Family traditions may fade away. These endangered items should not be lost and the solution is rather simple. Get together more often! In my family for example, we all meet several times a year, outside of major holidays, and this helps to preserve long traditions. For example, rappie pie is a Nova Scotian specialty, and has been eaten by the family for many past generations. We did not want this traditional recipe to die off, so the older generations have been teaching the younger ones, and we get together to share this delicious dish. We are ensuring that the tradition will continue for many years to come and that the recipe will not be lost. We also have an annual Soup Day, where various family members each prepare a different type of soup. Plus, we have homemade bread, another long-time recipe which is being passed down to the newer generations. This weekend was just our Soup Day, and we enjoyed everything from chicken soup to corn chowder, chili to beef stew. Are you losing your family traditions, or have you done something to continue them? Do you prepare family recipes that have been passed down through the generations? Do you get together with your extended family outside of major holidays to help preserve tradition? Don't lose what can be so precious. I am excited as AKA Bistro opens on March 30 this week. I previously gave my readers an inside look at this upcoming restaurant in Lincoln. It is a collaboration of Christian Touche, the GM who assisted in opening Ken Oringer’s Clio Restaurant in Boston, as well as managed it for 12 years, and Chef Chris Chung from Uni. The new restaurant will feature Japanese sashimi and traditional Provençal fare. You can now make reservations on Open Table. Please also note that they will be open for Sunday Easter Brunch on April 4, though they won't normally be open for regulr Sunday brunch for a few more months. I hope to check out the restaurant soon. Omakase (Chef Chung’s Arrangement)--The freshest and most original dishes in season. They will also be carrying a good variety of Sake! Niigita Kubota Manju "Ten Thousand Dreams"
Akita Akita Komachi Yuki No Bosha "Cabin in the snow"
Ibaraki Sato no homare "Pride of village"
Ibaraki Watari bune "Ferry Boat"
Yuki no Bosha "Cabin in the snow"
Hyogo Itami Onigoroshi "Ogre Tamer"
Niigata Kubota Senju "A Thousand dreams"
We take it for granted that Saké now comes in bottles, but that was not always the case. In fact, it is a relatively new matter. Though some wine had been sold in bottles since Roman times, it did not become the norm until the mid-1800s when mass produced, molded bottles became available. Prior to that time, bottles could vary significantly in size, so a consumer was never sure how much wine they were purchasing. Some regions even made it illegal to sell wine by the bottle because of that issue. Instead, consumers brought their own containers to the wine shop and could then buy a measured amount, pouring it into their own container. Saké on the other hand did not adopt glass bottling until fairly recently. In fact, it is thought that the first Saké to be bottled was not until around 1878. By 1909, the brewery Gekkeikan would start mass producing Saké in their own proprietary bottles but that was not the norm. Even after 1930, when continuous bottling machines were invented, Japanese breweries still did not openly embrace bottling. As of 1940, only 40% of all Saké was being bottled. It would not be until 1949 that nearly all Saké would finally be bottled. Instead of glass bottles, Saké was sold in a similar fashion to wine before bottles were mass produced. It was shipped to Saké shops in taru, wooden casks, and customers would go to the shops with their own ceramic containers to get them filled. Often, the Saké in these taru was genshu, undiluted Saké, which the shops were then expected to dilute on their own. Unfortunately, some less reputable shop owners would significantly dilute their Saké. This watered-down brew was sometimes referred to as kingyo-saké, or "gold fish Saké." It received this name because it was said that there was so much water in the brew that a gold fish could safely live in it. Chef Vittorio of Bistro 5 and Wine Sense will be hosting a special wine dinner, Unconventional Veneto. On Wednesday, March 31, at 7pm you can enjoy an interesting menu. Chef Vittorio has done endless research and reached deeply into his Italian roots to make this an authentic Veneto event unlike anything you have experienced before. To make this night even more special Chef Vittorio will be doing a rare Cooking Demonstration in the dining room during the event. For any guest who would like to participate that evening, Bistro 5 will also be taking donations for the American Red Cross Haiti Earthquake Relief. Bistro 5 will match up to $10 for each donation made. The dinner only costs $85.00 per person (not including tax and gratuity). Seating for this event is limited so please make reservations quickly by calling (781) 395-7464 . Chef Peppino of Da Vinci Ristorante will introduce a new concept to his menu this spring where Italian meets Indian. Beginning March 30th, Chef Peppino will roll out his new menu filled with items highlighting the bounty of spring and the exceptional union of the two cultures closest to his heart. Chef Peppino’s new Italian dishes with Indian accents include: Masala Agnolotti (Indian accents, spicy ricotta and English peas; stuffed with ginger, cherry tomato sauce and curried pesto); Rigatoni alla Peppino (rigatoni, shrimp, pancetta, asparagus, artichoke, flavored with cumin; sundried tomato white wine sauce); and, Sirloin Steak (chargrilled and served with truffled parmesan mash, sautéed asparagus, ginger cumin jus). To highlight the tastes of spring, Da Vinci’s new primi offers include: Beet Root Salad alla Da Vinci (white balsamic cured New England beets with goat cheese and pine nuts); Organic Spring Salad (organic greens tossed with fava beans, toasted almonds, pecorino shavings, moscato vinaigrette); and, Beef Carpaccio (shaved parmiggiano, celery sorbet). For the secondi course, guests will choose from seasonal pastas and entrees, such as: Gnocchi Pomodoro (homemade gnocchi served with fava beans, fresh tomato sauce and mozzarella); Pappardelle Boscaiola (sautéed morel and spring mushrooms, white truffle oil and shaved parmiggiano); Salmon (pan seared Alaskan Salmon with artichoke and sweet potato cake, sautéed baby spinach; finished with Prosecco sauce). Chef Peppino’s refreshing and exotic dolci options include: Papaya Cheescake (topped with fresh berries); Pear Crostata (served with pear gelato); and Rose Crème Caramel (finished with mango coulis). Da Vinci serves a customizable three-course menu for $35 every Monday through Thursday from 5pm-10pm, and Friday and Saturday from 5pm-6pm. After 6pm on Friday and Saturday, Da Vinci offers the a la carte version of the menu. Are you seeking an inexpensive four-course dinner with wine? At many restaurants, such a meal would cost you at least $50, and likely more. But there is one local restaurant where you can get such a deal for only $30, which I consider an excellent value. The Ashmont Grill in Dorchester has a Monday Night Wine Club where you can get a four-course meal with wine pairings for only $30. The restaurant is owned and operated by Chef Chris Douglass, who used to own Icarus in the South End. Chef Douglass also owns Tavolo, an Italian restaurant in Dorchester, not far from the Ashmont Grill. Ashmont Grill is a homey, neighborhood bistro with a dining area, lounge and large bar. It appears to cater to many locals, lots of regulars well-known by the employees. They have a full bar with specialty cocktails, wine and beer. I tried the Dixieland Tea ($9) which is made with Maker's Mark, lemonade, ice tea and orange bitters. It was very good, not overly alcoholic or sweet. A well-balanced and tasty drink. The wine list has about 10 wines available by the glass ($7-10) and bottles generally range from $26-$45. It seems that nearly all of the wines are organic or sustainable. The food menu has ten Starters ($6-$12), ten Mains ($15-$24, only 1 which is over $20), five Sandwiches ($5-$12) and five Si des ($3.50-$5). There is plenty of comfort food and hearty dishes on the menu. Each Monday night, the Wine Club showcases a different type of wine. On the night I went, Malbec wines were highlighted and upcoming on March 29, the dinner will offer German wines. Our first course of the evening was Argentine Mussel Soup, served in a mug. This flavorful broth contained mussels, rice and herbs. The tender mussels went well with the rest of the tastes, and it was a good choice for the raw, rainy night that evening. Unfortunately, I did not think the soup went well with the Malbec. Our first wine was the Los Cardos Malbec, which was a simple, fruity wine. It was an ok wine, just not a good pairing for the mussel soup. The second course was Grilled Portobello Chimichurri, with moist, meaty mushrooms and a tasty sauce which was not too spicy. This earthy dish went well with the Trapiche Oak Cask Malbec, which had rich, dark berry flavors, vanilla and some smokiness. This pairing worked much better than the first one. For the third course, we had BBQ Beef Brisket, plenty of succulent meat with a slightly sweet and spicy BBQ sauce. Another hearty dish which was perfect for the ill weather of the evening. The Michael Torino "Don David" Malbec was another good pairing, bringing flavors of ripe plum, plenty of spice and even a touch of chocolate. A very good BBQ wine which would be nice this summer with the grill. For dessert, we had the exceptional Torta de las Tres Leches, a moist and delicious cake which really impressed me. This certainly was a great way to end the dinner, and I would return for this cake alone. The wine for this course was Alma Negra Sparkling Malbec, an interesting wine and maybe the first sparkling Malbec I have tasted. It had some good red fruit flavors, and reminded me a bit of prosecco. For $30, this is a great deal, especially in these touch economic times. The food is excellent, and the wines are generally good. Service was excellent, and there is a fun ambiance in the place. Sometimes, they have communal seating for wine club nights, and you get to mingle with other wine lovers. After dinner, they also run a Monday trivia night, so you can stay afterwards, have a drink and some fun. The Massachusetts Affiliate of Susan G. Komen for the Cure is serving up a delicious way to fight and eradicate breast cancer as a life-threatening disease. Come to the 2nd Annual “Chefs for the Cure” food tasting event on April 9 and join some of Boston’s finest chefs at the Viking Center, a 10,000 square foot state of the art facility with 20 full working kitchens, for an evening of gourmet cuisine and fundraising. The event’s participating chefs include Joanne Chang of Myers+Chang and Flour Bakery, Michael Leviton of Lumiere, Jason Bond of Beacon Hill Bistro, Nicole Coady of Finale, Mary Dumont of Harvest, Rebecca Newell of The Beehive, Denise Baron of Burtons Grill, Evan Percoco of BOKX 109 American Prime and Jose Duarte of Taranta. Cost: $100 per general ticket, $150 per VIP ticket, which includes a 5pm-6pm VIP hour with an exclusive demo from a participating chef. The VIP demo will be conducted by Chef Alissa Bigelow from Rustic Kitchen’s “In the Kitchen”. Though Alissa is not sampling dishes during the event, she is the host for the evening. She is planning to make Grilled Lobster Salad Sliders two ways: one traditional with crème fraiche and chives on mini brioches & also Lobster salad with a Ginger, Sesame Yuzu dressing on a Won-Ton Crisp. Proceeds from the event will enable the Komen Massachusetts Affiliate to continue its mission of reducing breast cancer in the state by funding education, screening and treatment programs, with an emphasis on the medically underserved. The Affiliate is committed to 100% screening, 100% access to care. About Susan G. Komen for the Cure®, Massachusetts Affiliate: The mission of the Massachusetts Affiliate of Susan G. Komen for the Cure is to eradicate breast cancer by advancing research, screening, care and education. Established in 2001, the Massachusetts Affiliate of the Susan G. Komen for the Cure works to reduce breast cancer in MA by funding education, screening and treatment programs, with an emphasis on the medically underserved. In 2009, with the help of the fundraising programs including as the Susan G. Komen Massachusetts Race for the Cure® and other individual and corporate supporters Komen Massachusetts raised over 2.3 million dollars. The MA Affiliate continues to grow and acts as a caring resource for local women and their families. For more information, please visit www.komenmass.org or call (617) 737-5111. As I mentioned yesterday, I recently attended “For The Health Of It,” a seminar and salmon tasting organized by Oldways Preservation Trust, a Boston-based "non-profit food issues think tank.” I concentrated yesterday on the health benefits of fish and today's post will discuss the rest of the fascinating and delicious event. We began with a salmon tasting, including some superb smoked salmon. The salmon was moist, flavorful, and quite delicious. Different peoples in the Yukon area use varied woods when they smoke salmon, providing a different flavor profile to their products. I thus started off in a very good mood, pleased with the salmon. There were then some brief opening remarks, including an interesting item about the history of salmon consumption. Most people are familiar with the famous Lascaux cave paintings in France. These Paleolithic images depict horses, stags, cattle, people and more. These caves though are located by a river known for salmon. In this area, middens, basically dumps for waste, have been found filled with 20-30 feet of salmon bones. Thus, salmon consumption has a long and ancient history. After the lecture by Dr. Mozaffarian, the next speaker was Jack Schultheis, the General Manager of Kwik’pak Fisheries. Kwik’pak was formed in 2002 to protect and support the local communities, six villages, and fisheries of this remote region. All of these fisheries are sustainable, certified by the Marine Stewardship Council. Kwik'pak is also a member of the Fair Trade Federation, the only seafood company with that distinction. In addition, Kwik'pak has a state-of-art processing plant in the village of Emmonak, so they can ensure the fish they ship is as fresh as possible. The Yukon River is huge, about 2200 miles long, and at the delta, there are a number of small villages, home to Siberian Yupiks. They might be the oldest inhabitants of North America and originally settled here due to all the available food. The Yupik communities are small, family oriented. Families go fishing on 22-foot skiffs, so these are not large commercial fishermen. There are only about 700 family fishing permits in this are. Though 160-200 million salmon are caught each year in Alaska, only about 1 million are caught in the lower Yukon region. The salmon they catch are primarily chum, also known as dog salmon or Keta salmon. Kwik'pak appears to be referring to them as mostly as Keta, likely as it sounds better than chum or dog. These Yukon salmon travel great distances, up to 2000 miles or more, from the Bering Sea to their spawning grounds in British Columbia. Interestingly, once the salmon reach the Yukon, they stop eating until they reach the spawning grounds. They load up on food before getting to the river, thus their bodies are stuffed with beneficial oils. The Yupik catch the salmon just as they enter the Yukon, when they are at their fattest. There was then a cooking demonstration by Chefs Jeff Tenner and Pete Doire of Legal Sea Foods. As they could not cook here, they just showed us how they would prepare a couple dishes, including Brown Bag Salmon and Salmon Ceviche. We also received copies of the recipes so we could replicate them at home. The ceviche looked especially compelling. Next up, there was a moderated Q&A with a few Yupik, including Ellen and Humphrey Keyes, and Matilda Oktoyuk. The Yupik live in the villages of Emmonak, Alakanuk, Grayling, Kotlik, Nunam Iqua and Mountain Village. Their motto is "We live to fish and fish to live." They largely live off the land, hunting, fishing and gathering. It is a hard life but Ellen, Humphrey and Matilda all seemed very happy with their lives, content with their existence. They really had no complaints. They were down-to-earth, humble and pleasant people. Salmon is very important to their lives, and salmon season begins in June. This is almost the start of summer for the Yupik, as their cold weather continues into May. But the season lasts for only about six weeks, when the weather permits their small skiffs to safely traverse the waters. During that time period, they need to catch enough salmon to last them year round. On an average fishing day, a boat will bring in 200-300 fish. The event finished up with more salmon tasting, good-sized pieces of moist fish with four different sauces. The blueberry sauce really was good, and went very well with the salmon. Overall, this was a very compelling and informative event. Kwik'pak Fisheries is the type of company you should support, as it provides a sustainable and delicious product as well as helping a worthy community, the Yupik. Plus, the health benefits of the Yukon Keta salmon are enormous, and make it even more of an attractive product. The salmon will be available in the Boston area probably some time in June, and I highly recommend you check it out. It may be a bit pricier than other salmons, but I think it is well worth the added cost. I will certainly seek out this salmon when it becomes available here. For Easter this year, why not stop by The Beehive for Easter Brunch. Plus, your childre can meet the Easter Bunny!. Doors open from 10am-4pm for The Beehive’s Easter Jazz Brunch. Featuring live music and comfort-cuisine classics by Executive Chef Rebecca Newell like, Thick-cut French Toast - served with Chantilly cream and maple syrup ($12) and The Beehive’s acclaimed Eggs Shakshuka - Sunnyside eggs baked “North African Style” with tomato sauce and polenta ($12). Pair your selections with one of The Beehive’s signature cocktails or enjoy the mimosa of your choosing with one of the most extensive champagne lists in New England. Made for kids of all ages, parents will delight as their children participate in The Beehive’s yearly Easter egg hunt and a special visit from the Easter Bunny himself! If you choose to sleep in, The Beehive still has you covered. Enjoy Easter dinner starting at 5pm with food & cocktails and a special live performance by “This is Boston Soul” at 8pm. For reservations please call 617-423-0069 or visit beehiveboston.com. Though I knew fish was good for your health, I did not know the true extent of its health benefits, especially for your heart. I am not sure many people really understand that extent. Fortunately, I recently attended an event which provided me some fascinating information concerning the health benefits of fish and Omega-3s. In short, most of us should be eating more seafood. “For The Health Of It,” was a seminar and salmon tasting organized by Oldways Preservation Trust, a Boston-based "non-profit food issues think tank.” They are the creators of the Mediterranean Foods Alliance, the Whole Grains Council, and the Latino Nutrition Coalition. Oldways was created to "advocate a return to healthy, traditional old ways of eating." They also organize various educational events "about healthy eating, drinking, lifestyle and the traditional pleasures of the table." The salmon seminar was held at the elegant Harvard Faculty Club, and the audience included a variety of individuals, from writers to seafood distributors. I will go into further detail about this event in another post tomorrow, as I want to concentrate this post on a specific issue, the health benefits of fish. One of the first speakers at this event was Dariush Mozaffarian, M.D. Dr.P.H., an Assistant Professor in the Department of Epidemiology and Nutrition at the Harvard School of Public Health. He is also part of the Division of Cardiovascular Medicine, Brigham and Women’s Hospital and Harvard Medical School. He is a cardiologist and has been studying nutrition for about ten years. Research has been providing growing evidence of the health benefits of fish, for the heart, brain, and bones as well as against cancers and inflammatory diseases. But some of the strongest evidence is for its significant benefits to preventing heart disease. Fish contains Omega-3s, fatty acids included eicosapentaenoic acid (EPA) and docosahexaenoic acid (DHA). Those polyunsaturated fats have been proven to significantly reduce the risk of cardiovascular death. In fact, this is the only dietary factor where there is clear proof that it can reduce cardio-related deaths. Consider that a daily intake of 250mg of EPA and DHA will reduce our risk of cardio-related death by one-third, which is greater than the effect of statins. This amount would be equivalent to about two servings a week of wild salmon. Omega-3s are the first line of defense for cardiovascular health. They are also very important to the brain development of infants and pregnant women should eat fish. Now what about concerns of mercury, PCBs and Dioxins in fish? In short, worries about those matters are needless. They do not pose a significant threat, and the health benefits of Omega-3s far outweigh any risks. Dr. Mozaffarian stated the general public should not have any concerns about mercury unless you are eating fish five times a week or more. As for pregnant or nursing moms, they do have to be a little more careful but still should eat fish to garner the substantial benefits of Omega-3s. He recommended they should eat up to 12 ounces a week of a variety of seafood, including up to 6 ounces of albacore tuna. They should though avoid the four fish that have the highest mercury levels: shark, swordfish, king mackerel, and tilefish. Plus, they should check local advisories for any fish caught by family and friends. This is all supported by the FDA and the American Heart Association. PCBs and Dioxins also do not pose a significant threat. PCBs were outlawed in 1977 and Dioxin emissions have been reduced by 90% since 1987. There was a study on salmon intake that showed increased deaths due to PCBs and Dioxins, yet it was based on 7 servings of wild salmon or 3 servings of farmed salmon per week, for seventy years. Plus, the added amount of deaths was 24 for wild salmon and 8 for farmed salmon. It failed to consider though the amount of cardio deaths that would be prevented due to the Omega-3s in the salmon. In fact, 7125 deaths would be prevented, making the added deaths very insignificant, the benefits far outweighing any risks. Plus, there are more PCBs and Dioxins in beef, chicken, pork, dairy and vegetables than in seafood. Once again, the FDA supports these conclusions. In general, farmed salmon has the great amount of EPA and DHA, over 2.5 grams per 3.5 ounce serving while wild salmon has just over 1 gram. Anchovies and Atlantic herring are high in EPA and DHA too, both with over 2 grams. Fish from specific areas may contain more or less EPA & DHA. For example, wild Yukon Keta salmon actually possesses up to 5.2 grams, which makes it even better than farmed salmon. The conclusion is obvious, eat more fish! The health benefits of Omega-3s are significant, especially in the prevention of cardio-related deaths. The benefits far outweigh any risks from mercury, PCBs and dioxins. One of your best fish options, for the highest levels of EPA and DHA, is salmon, especially wild Yukon Keta salmon. It bears repeating: Eat More Fish! Stoneham Sun: Are You Adventurous? My new column of "A Passionate Foodie" can be found in the March 24 issue of the Stoneham Sun newspaper. This is a weekly column that concentrates on reviews of local restaurants though it also sometimes touches on other food and wine topics. The new column has been published today and will be available online soon. The new article is a restaurant review of Coppa, a value Italian enoteca in the South End. Chef Jamie Bissonnette has created an exciting and adventurous menu, and it is very understandable why there are long waits to get into this place on the weekends. If you have any questions or comments about my column, feel free to add them here. I've tasted over 200 different grapes and I am on a quest to make it 300. So when I see a wine containing a grape new to me, I usually buy it. One of my recent purchases was at The Wine Bottega, where I found an Austrian wine made from Roter Veltliner. Though you are likely to think this grape is related to Grüner Veltliner, it is not. Roter Veltliner, which is also known as Roter Muskateller and Roter Reifler, is an ancient grape whose parentage is unknown. "Roter" means "red" though the grape actually only has a pinkish tinge and it makes white wine. "Veltliner" refers to the Austrian village of Veltliner. Some of the best Roter wines are produced in the Wagram district of Austria. The Wimmer-Czerny winery, which is over 250 years old, is located in the village of Fels Am Wagram, in the Wagram region. This village is about 50 miles west of Vienna on the Danube River. The current owner, Hans Czerny, is committed to minimal intervention in the vineyards and in the cellar. The vineyards are now certified organic and biodynamic. His 15 hectares of vineyards are planted with 60% Grüner Veltliner, 10% Riesling, 10% Roter Veltliner, and the remaining 20% divided between Zweigelt, Weißburgunder, Traminer and Sauvignon Blanc. The winery produces are 80,000 bottles a year. The 2008 Wimmer-Czerny Roter Veltliner ($20-$22) has a deep gold color, and a pleasing aroma of fresh citrus. It is a very crisp wine, with bright citrus flavors (especially lemon), some mineral notes and mild spice tastes. It was a very easy-drinking wine, with an alcohol content of 12%, and paired well with chicken. Though it did remind me of Grüner in many ways, the interesting spice tastes, reminding me of autumn, gave it a more unique flavor. It is an enjoyable wine and I do recommend it. On Wednesday, March 31, The Beehive will be hosting their first ever “Armenian Night” - featuring cuisine, libations and entertainment highlighting Armenian culture. With musical performances by the Yerevan Quintet and Musaner, and Armenian food specials prepared by Executive Chef Rebecca Newell joined by special guest Chef Marc Orfaly of Pigalle, the evening is not to be missed. The partnering chefs will be creating items such as deluxe mezze platters with assorted salads, char-grilled lamb chops with basmati rice and bean pilaf paired with apricot martinis to name a few! This unique evening is brought to you in partnership with Hamazkayin-Boston, an Armenian educational and cultural society. Celebrate Armenian culture, music and food at The Beehive! Anoush! The brainchild of Jack Bardy, Co-Owner, Jennifer Epstein, Co-Owner and General Manager Bertil Jean-Chronberg, the evening is part of The Beehive’s continuing effort to highlight numerous cultural voices through artistic expression. Yerevan Quintet: The Yerevan Quintet will perform a collection of traditional Armenian songs as well as original compositions interspersed with classical piano, flute, bass and drums. The performance includes folk songs with contemporary arrangements and songs of many famous Armenian composers. Performers include: Samvel Galstian/vocals; Gegham Margarian/piano; Yulia Musayelyan/flute; Fernando Huergo/bass; Karen Kocharyan/drums. Musaner: Musaner is a musical project directed by composer and pianist Ara Sarkissian. With regular performances at The Beehive, this uniquely evocative musical group encompasses original folk music compositions and arrangements from Armenia. Folk instruments from Armenia blend with the traditional language of a jazz band to create a new and original sound. While some compositions evoke the post-modernism of European composers, other arrangements rely on rhythmic and harmonic elements to stay close to the character of the original folk material. Performers include: Ara Sakissian/ Composer & Pianist; Ken Field/flute; Todd Brunel/clarinet; Daniel Bennett/saxophone; Martin Haroutunian/dap, zurna, pku, parkapzuk, duduk and shvi; Fabio Pirozzolo/percussion; Roberto Cassan/accordion; Bake Newman/bass; Gary Fieldman/drums. Don’t miss this exciting event for one night only at The Beehive! For Reservations or more information please call 617.423.0069 or visit www.beehiveboston.com. Rant: Are Millennials the Future of Wine? There is much talk about Millennials and how they are the future of wine. The obvious answer is that as they are the next generation, they are the future of wine. Simple logic. But, what will that really mean? Will their spending habits be greater than other generations? The jury appears to still be out on that question. "Nielsen analyzed the shopping habits of four key generations - greatest generation (aged 64+), boomers (45-63), gen x (33-44) and millennials (15-32) - and gave a rundown on what marketers should expect when targeting these groups. Interestingly, wine is one of the largest spending categories for seniors at $124 per year. Boomers spend $125 per year on wine, while gen x spends $78 and millennials spend $61 annually." So Millennials are spending half what Boomers and Seniors spend, and about 20% less than Gen X. So when will this change, when will Millennials be spending more money on wine? Or will it never change to any significant degree? Is the publicity about Millennials being the future of wine merely sound and fury, signifying nothing? What is the reality beyond the hype? Beyond the Millenbial issue, it is intriguing how little people spend, on average, for wine each year. Wine still needs to make much greater inroads among all segments of the population. I know that I spend way above average on wine each year. I have spent more money on a single visit to a wine store than the average person does all year. Most other wine bloggers are probably in the same situation. I think wine marketers should consider addressing all generations, as none of them are really spending an inordinate amount of money on wine. There is opportunity with all four generations, and ignoring any segment is ignoring oppurtunities. Wine consumption may be continuing to increase in the U.S., but it can easily grow much more. Cost: $38 per person, and a gratuity of 20% will be automatically added to your bill. Reservations for The Beacon Hill Bistro’s Easter Brunch are highly recommended and can be made by calling 617-723-7575. Which animal allegedly loves Saké but purchases it with fake money? 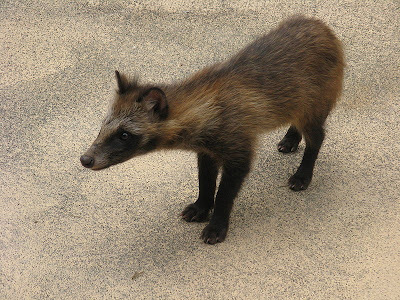 In the photo above, the animal that resembles a raccoon is a Tanuki. In Japanese folklore, Tanuki are mischievous shape-shifters with supernatural powers. They can transform into anything, whether living or inanimate, but their usual forms are monks and tea kettles. Supposedly, they place special leaves on their heads and chant before they can transform themselves into a different form. Some legends claim the leaves are from the sacred lotus plant of Buddhism. Besides their shape-shifting ability, they can also cast powerful illusions on other items. For example, they can make leaves appear to be money, or even make dung look like delicious food. So definitely beware if dining with a Tanuki. As Tanuki most often inhabit forests and wooded area, their main targets for their mischieveous pranks are hunters and woodsmen. But they could play tricks on anyone entering their territory. Tanuki statues, like above, are very common in Japan, especially outside restaurants and bars, where they beckon to people to enter those establishments. These Tanuki are most often depicted with a large stomach, over-sized testicles, a straw hat, a flask of Saké and a promissory note. Tanuki are supposed to love Saké and in the legends that often buy it with fake money, leaves they have cast an illusion upon. The Tanuki is also considered a sign of good luck, and possesses eight traits that reflect this fact. On the Saké bottle they carry is often written the Hatchi symbol, which means "eight." The eight traits include: a hat to protect against trouble or bad weather; big eyes to see what is around them and help make wise decisions; a Saké bottle that represents virtue; a big tail that provides steadiness and strength; over-sized testicles that symbolize financial luck; a promissory note representing trust and confidence; a big belly symbolizing bold and calm decisiveness and a friendly smile. The Tanuki is more than just a legend. It is actually a real animal, but it is not a raccoon or badger. It is a type of dog that can grow to up to 60cm in length and has distinctive stripes of black fur under its eyes. Tanuki are native to Japan, southeastern Siberia and Manchuria, and they live in the lowlands, forests and mountain valleys. They probably though don't really drink Saké. Yesterday, I provided some Greek wine recommendations, and I am continuing, giving even more recommendations of the most compelling wines I sampled at a recent Greek wine tasting held by Athenee Importers. Founded in 1903, the family-owned Argyros Estate is located on the island of Santorini. The vineyards cover 64 acres, and some vines as as old as 300 years. The winery concentrates on indigenous grapes and is very well known for its Vin Santo. The 2008 Atlantis White is a blend of 90% Assyrtiko, 5% Aidani, and 5% Athiri, all indigenous Greek grapes. This wine lures you in with his fruity nose, lots of citrus, and then follows through on your palate with those same tastes. Very crisp and easy-drinking, this is another excellent summer wine, as well as a very good food wine. Though simple, it still has some character, and is a good value wine. The 2007 Atlantis Red is a blend of 90% Mandilaria and 10% Mavrotragano, also indigenous grapes. Initially, this wine reminded me a bit of Dr. Pepper, without the effervesnce, though that is not a bad thing as I like the taste of Dr. Pepper. There were sweet fruit flavors, some caramel notes and touches of spice. The finish lingers and it leaves you satisfied. It was actually an intriguing wine, but I am unsure whether everyone will like this one. But I think it is worth checking out. The 2002 Vin Santo Mezzo is a blend of 80% Assyrtiko, 10% Aidani, and 10% Athiri. The grapes were dried in the sun for six to seven days, aged in French oak for five years, and has an alcohol content of 14%. This compelling wine has fascinating honey and tropical fruit flavors, is not too sweet, and lingers pleasantly in your mouth for quite a time. A complex and flavorful wine, I heartily recommend this vin santo. Pair this with a delicious fruit dessert or just savor a glass after dinner. Founded in 1932, this winery first planted vineyards on the slopes of Mount Pendeli in Stamata, not far from Athens. When they eventually had to sell much of that property, they acquired another vineyard in Nemea. They still own six acres in Stamata and their vineyards are planted with indigenous and international varieties, including Savatiano, Asyritiko, Chardonnay and Cabernet Sauvignon. Their vineyards are also organic. The 2008 Harlaftis Nemea is a red wine made from Agiorgitiko, and has spent twelve months in old French oak. A pleasant, easy-drinking wine it possesses delicious bright, red fruit flavors with mild spice notes and hints of leather. The tannins are relatively mild and the finish is moderate. The 2001 Reserve Nemea is also made from Agiorgitiko but it is more of a high-end wine, a wine meant to ponder and savor, rather than just guzzle and enjoy. The grapes are from 50 year old vines, and the wine has spent three years in French oak. This is a smooth, complex wine with a very lengthy and pleasing finish. The wine has flavors of violets, dark berries, plum, and hints of chocolate. A very impressive wine showing the high potential of Greek wines. For more information on this winery, check out my prior post. The 2007 Syrah was a Greek wine made from an international grape which I enjoyed. The wine was aged for fourteen months in French oak and has an alcohol content of 15%. The wine had lots of spice and dark plum and blackberry flavors. It was a good wine, though I am not sure you would know this came from Greece. In 1978, Spiro-Nicholas Cosmetatos planted his first vineyards at his family estate in Cephalonia. The vineyards were planted with indigenous and international grapes, and the first vintage was not released until 1984. The winery practices organic viticulture. "Gentilini" is the surname of Spiro's paternal grandmother. The 2008 Aspro is an intriguing blend of 40% Tsaoussi, 40% Muscat of Cephalonia, and 20% Sauvignon Blanc. It is creamy and full-bodied, with flavors of citrus and honey and has a fairly long finish. There are also some subtle herbal notes beneath the fruit which add to the flavor of the wine. One of my favorite white wines of the tasting. The 2007 Red is a blend of 60% Agiorgitiko and a 40% mix Syrah and Mavrodaphne. The wine spends six months in new French oak. A delicious wine with nice red fruit flavors, spicy notes and moderate tannins. It has some character and would probably be a good BBQ wine for the summer. These two estates together encompass 150 acres, with vineyards in Messogia Attica and Asprokampos Nemea. The Domaine Vassiliou vineyards were first planted in 1905. The Nemeion vineyards are all organically farmed. The estates grow indigenous Greek grapes. The NV Retsina greatly surprised me, providing me a new appreciation for this wine. Retsina is a resinated wine, with an ancient history, that is traditionally made from the Savatiano grape, sometimes with Assyrtiko, Roditis and other grapes blended in. Small pieces of Aleppo Pine resin are added during fermentation. That may not sound appetizing and my own previous experiences with retsina were not pleasant, as the wines smelled and tasted almost like turpentine or Pine Sol. This wine though was very much unlike that. Instead, there was a very mild pine flavor, as well as other interesting herbal components. A very smooth and pleasant wine, I could easily drink and enjoy several glasses. It reminded me, in part, of some herbal liquers, and I could easily picture this wine as a component in a delicious cocktail. The 2004 Hgemon Grand Reserve is made from 100% Agiorgitiko. It is a very intense wine, with rich red fruit flavors, vanilla, white pepper and chocolate. It has smooth tannins, a very long finish, and plenty of complexity. There is a hint of exoticism in the taste, a flavor I cannot identify but which is compelling and unusual. A top-notch wine. I tasted the latest vintages of the 2008 Notios White and 2008 Notios Red, both which were equally as good as the prior vintages I have enjoyed. As these wines sell for under $15, they are excellent value wines. The NV Ritinitis Nobilis Retsina was the second retsina at the tasting, and I enjoyed it as well. It had more of a pine aroma and taste than the other retsina, but still well within a pleasing limit. It was very herbal, with a delicious blend of tastes. It was suggested this wine would pair well with curry and spicy dishes, and it would make for an interesting test. So I found two retsinas I liked, though they were significantly different from each other. The 2006 Gai'a Estate is made from 100% Agiorgitiko, and is a single vineyard wine that spent about 16 months in new French oak. Another smooth, complex and delicious wine, and I have realized that this grape is capable of some excellent, high-end wines. I thoroughly enjoyed most of the wines from this tasting made from Agiorgitiko. If you are not familiar with this grape, I highly recommend you hunt it down. I tasted the NV Ode Pantos Brut again, and it impressed me as much as it did before. This was the only sparkling wine of the tasting, but it made for an excellent showing. It gets a high recommendation. The 2009 Meliasto Rose also impressed me, a blend of 60% Moschofilero and 40% Agiorgitiko. It had an alluring fruit smell and tasted very Old World. It was dry, with more subtle flavors of strawberry and watermelon, and a bit of minerality. This is the style of Rose I most enjoy and thought this was a very good example. As the weather gets warmer, there is more and more reason to drink Rose. Taste more Greek wines! You'll find delicious and enjoyable Greeks wine in all categories: white, red, sparkling, dessert, value and high-end. Though they might be more difficult to locate at your local wine store, seek them out and recommend to you local wine store owner to carry some Greek wines. Especially try wines made from indigenous Greek grapes and experience their unique flavor profiles. What have your experiences been with Greek wines? Locally, some wine regions just don't seem to get much respect. It can be very difficult to find wines from certain regions at local wine stores. But those wines can be delicious and excellent values, or exceptional, high-end wines. Wine stores have an opportunity to showcase such wines, to present them to the public and let their customers know the wonders of such wines. These wine stores can place themselves on the cutting edge. Greek wines don't get sufficient respect. There are many excellent Greek wines out there, and I consider myself a fan of wines from this region. But I have trouble find Greek wines. If a local wine store carries any Greek wines, it most likely only stocks a few bottles. Ball Square Fine Wine & Liquors carries one of the largest Greek wine selections in the local area but more stores need to carry Greek wines. Hopefully that will change in the near future, as more people come to taste and find enjoyment in these wines. I recently attended a trade tasting of Greek wines, held by Athenee Importers, with ten wineries displaying a total of over 50 wines. For some basic information about Greek wines, check out one of my prior posts. That post has some additional links for more info on Greek wines and the Athenee website also is very informative. At the tasting, I find plenty of wines I would recommend. In general, I preferred the wines made from indigenous Greek grapes rather than international varities. As their indigenous grapes are found nearly no where else, it gives their wines a more unique flavor profile. I can find Syrah wines all over the world, so why do I need a Greek one as well? It may be a good wine, but it is not significantly different from all of the other Syrahs out there. I would much rather drink a wine made from Xynomavro, which I can't get elsewhere. I also gained a new appreciation for retsina. Prior to this tasting, my previous experiences with retsina have not gone well. The pine flavors were overwhelming, and some even reminded me of Pine Sol. But I tasted two retsinas at this tasting which I actually enjoyed, and I will discuss them in more detail later. I was also pleased to taste a few grapes that were new to me. As I have tasted over 200 different grapes, it is not always easy to find something new. But I added a few more grapes to my list after this tasting, which is always a good thing. If you want to experience the taste of some new grapes, then you definitely should taste Greek wines. So let me now offer some recommendations of the most compelling wines I tasted. This family-owned estate is located in the Western Peloponnese on the plateau of the Ichthis peninsula. The estate was founded in 1864 and the first vineyard was planted with imported Refosco grapes. Since 1987, work was done to revitalize production and new vineyards were planted. Currently, they grow over 15 grape varieties, both indigenous and international. 2009 Kallisto: This is a Regional Dry White Wine of Ilia. It is a blend of two indigenous grapes, Assyrtiko and Robola. This was an interesting, crisp wine, with bright flavors of citrus with hints of exotic spice and even a light smokiness. It was a more unique white wine, and would be a good food wine too. 2005 Antares: This is a Regional Dry Red Wine from Ilia. It is a blend of one indigenous grape and one international one, Avgoustiatis and Mourvedre. This was a compelling wine, with rich flavors of blueberries, dark berries and violets. It also had a strong, spicy backbone with moderate tannins and a lengthy finish. Plenty of complexity, this would be an excellent food wine for a thick steak or a hearty stew. 2004 Cava Red: This is a Regional Dry Red Wine of Letrina. And no, this is not a sparkling wine from Spain. It is a blend of 80% Refosco dal Peduncolo Rosso and 20% Mavrodaphne. The wine is aged for 8 months in new Berthomieu and Ermitage French barrels and rests for at least 12 months in the bottle. This wine reminded me of a nice Bordeaux, with flavors of plum, raspeberry, spice and leather. There were hints of vanilla too. The tannins were smooth and the wine was very smooth, something to savor on a cool evening. 2002 Chortais: This is a Sweet, Aged Red Wine. This wine is a blend of sun-cured grapes of Mavrodaphne and Korinthiaki, where the fermentation process was interrupted at a suitable time for the addition of alcohol. The wine is then aged for five years in French oak before bottling. It was an interesting dessert wine, full bodied but not overly sweet, with flavors of prune, plum and caramel. Smooth on the palate, it would make a nice after-dinner drink. The winery and vineyards, planted in 1967, are located on the Sithonian Peninsula of Chalkidiki. are the vineyards and winery of Porto Carras. Currently, the vineyards contain about twenty-seven varieties, both indigenous Greek and international. 2008 Malagousia: This is a Regional Dry White Wine of Sithonia, made from 100% Malagousia. This grape nearly vanished into extinction until this winery helped resurrect it. The wine is fermented in stainless steel, aged in French oak for almost six months, and has an alcohol content of 13%. This wine reminded me of a Gewurtzraminer, having an exotic flavor of apricot and lychee with spicy notes. Very easy drinking, I would be curious how this wine would pair with Thai or similar Asian fare. 2007 Limnio: This is a Red Dry Wine, Cotes de Meliton, Appelation d'Origine de Qualite Superieure. It is a blend of 90% Limnio 90% and 10% Cabernet Sauvignon. The wine was aged for 12 months in new French oak and has an alcohol content of 12.5%. Limnio is one of the oldest grapes in the world, and was even mentioned by the philospher Aristotle. This light colored wine, was soft with lots of cherry flavors. Another easy drinking wine, this was like a light and simple Pinot Noir. BOKX 109 will feature a brunch buffet with three distinct stations, meticulously crafted by Executive Chef Percoco. Some items from the Cold/Salad section include: Roasted Beets; Ice Bokx of Native Crab Claws, Poached Shrimp, Mussels; and Oysters; Pastrami Smoked Salmon with Assorted Bagels, Spreads and Breads; and, Fresh Fruit Parfiats. Choices from the Chefs Table include: Lobster Bisque; Cheesy Egg Scramble with Crispy Potato; Buttermilk Pancakes with Caramelized Banana Compote; Passion Fruit Infused Loin of Kurobuta Pork with Creamy Savoy Cabbage; Goat Cheese Stuffed Breast of Statler Chicken; Wood Grilled Swordfish with Sweet Potato Gnocchi and Brussel Sprouts; Red Wine Braised Brandt Beef Shortrib with Celery and Black Truffle Risotto. For the Finale options, guests will enjoy Assorted Truffles, Blondies, Petit Fours and Mini Tarts. Davio’s will have “Buona Pasqua” specials in addition to serving their regular menu. Davio’s specials include: Zuppa di Pasta e Fagioli – pasta, white bean, escarole soup ($8); Ravioli di Piselli – pea ricotta ravioli, grape tomato, garlic, lemon zest, pea tendrils ($27); Merluzzo in Umido – oven roasted cod, laughing bird shrimp, Swiss chard risotto($35); and, Agnello Arrosto – rack of lamb with roasted garlic mashed potatoes, minted lamb jus and haricot vert ($29). If you want to purchase a car or TV, or even a computer, you might peruse Consumer Reports to garner their opinion on your potential purpose. But, if you wanted to buy an organic tomato, breakfast cereal or ice cream, Consumer Reports would probably not be a resource you might consider. 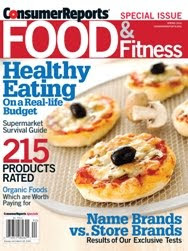 That might be changing though as Consumer Reports has published a special issue, Food & Fitness. This 84 page magazine, costing $6.99, might be a one-shot issue, though there is some indication that additional issues may be published in the future, though not on a regular basis. It is well worth picking up this magazine though as it is filled with lots of valuable advice and recommendations. The magazine begins with some Food Tests, including breakfast cereal, oatmeal, orange juice, pancakes in a can, coffee, peanut butter, yogurts for children, ice cream, veggie burgers, and more. These are similar to the standard product comparisons you find in Consumer Reports. The next section is a Supermarket Survival Guide, which has six articles, two of which are comparisons such as a comparison of 59 national chain supermarkets. What I found more interesting was an article called Sidestep These Supermarket Traps. It produces good advice on how to lower your grocery bill, or buy better products. Another valuable article is When It Pays to Buy Organic. Did you know that on average, you'll pay 50% extra for organic food, as as much as 100% extra for organic milk and meat? This article gives you suggestions on how to get less expensive organic food and they follow up indicating which items are best bought organic and which organic items are not that useful. There is a section on Expert Tips, including What The Label Means, which is a fascinating article. Learn what it means when a label states "Whole grains" or "100% organic." What surprised me was the information on "cage free" and "free range." There is no regulation on the term "cage free" so it is relatively meaningless. "Free range" only applies to poultry, not eggs, and it does not mean much either. All it takes is 5 minutes a day of open-air access to qualify. Check out the item on Value Vitamins, which discusses whether you need a multivitamin or not, or the article Under The Influence, which provides advice on protecting your children from the deluge of food advertisements on television. The Healthy Eating section has plenty of informative articles, on everything from better ways to dine at home as well as dining out. It includes articles on incorporating dietary restrictions into your cooking, and also provides some recipes. Finally, the Fitness section, provides information on how to exercise as well as product comparisons on exercise machines. Overall, this magazine is loaded with fascinating and practical information, giving you lots of value for your money. The information is well written and easily understandable. I hope that they continue to publish more of these magazines, expanding their coverage to other food and fitness topics. Issues of health, sustainability, organics, and such can be very complex issues and people need good resources to delve to the heart of such matters. This magazine is a good starting resource. Why not make Easter Brunch reservations at Burtons Grill, located in the Fenway District in Boston, MA? Enjoy “brunching” on signature dishes and classics such as, Crab Cakes Benedict - Two gently poached eggs placed atop of lump crab cakes and English Muffins topped with a lemon hollandaise sauce, served with seasonal fruit and herb roasted home fries ($14.95), or how about the Burtons Grill Short Stack - Three light fluffy pancakes topped with a fruit compote and your choice of Applewood smoked bacon or sausage ($9.95). Don’t stop there…have you heard about Burtons Grill new Brunch Beverage Cart? What’s better than a Bloody Mary, Bellini or Mimosa in the morning? - How about having it prepared table-side from scratch? Choose you own juices, mixers and garnishes, sit back and relax knowing that there are no dishes to clean and you all came in separate cars. But wait, there’s more! Each table that dines at Burtons Grill on Easter Sunday will receive a special Easter Egg at the end of their meal. What surprises lay inside each pastel presentation? You will get great reasons to come back to Burtons another time such as: a free dinner for two, free appetizers, beverages and much, much more. Every egg is a winner and so are you if you choose Burtons Grill Boston for Easter Brunch! Burtons Grill Easter Brunch will be served Sunday, April 4 from 11am-3pm. No worries, we’ll have you home in enough time to catch the first pitch of the Red Sox opener or if you’re attending the game you’re in walking distance! Stoneham Sun: Want to Make Dumplings?